Downward propagating instabilities are often observed at the bottom of volcanic plumes and clouds. These instabilities generate fingers that enhance the sedimentation of fine ash. 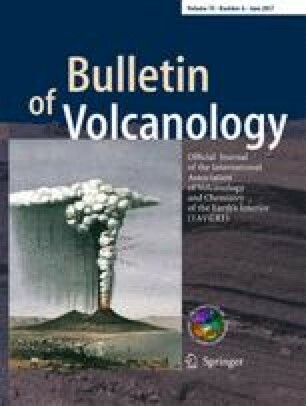 Despite their potential influence on tephra dispersal and deposition, their dynamics is not entirely understood, undermining the accuracy of volcanic ash transport and dispersal models. Here, we present new laboratory experiments that investigate the effects of particle size, composition and concentration on finger generation and dynamics. The experimental set-up consists of a Plexiglas tank equipped with a removable plastic sheet that separates two different layers. The lower layer is a solution of water and sugar, initially denser than the upper layer, which consists of water and particles. Particles in the experiments include glass beads as well as andesitic, rhyolitic and basaltic volcanic ash. During the experiments, we removed the horizontal plastic sheet separating the two fluids. Particles were illuminated with a laser and filmed with a HD camera; particle image velocimetry (PIV) is used to analyse finger dynamics. Results show that both the number and the downward advance speed of fingers increase with particle concentration in the upper layer, while finger speed increases with particle size but is independent of particle composition. An increase in particle concentration and turbulence is estimated to take place inside the fingers, which could promote aggregation in subaerial fallout events. Finally, finger number, finger speed and particle concentration were observed to decrease with time after the formation of fingers. A similar pattern could occur in volcanic clouds when the mass supply from the eruptive vent is reduced. Observed evolution of the experiments through time also indicates that there must be a threshold of fine ash concentration and mass eruption rate below which fingers do not form; this is also confirmed by field observations. The authors are grateful to M. Prestifilippo and E. Rossi for the useful discussions, to L. Pioli and J. Ruch for their help during the experiments at the Geneva laboratory and to F. Arlaud for technical support. The work was funded by the ESF Research Networking Programmes, Reference N°4257 MeMoVolc, by the project “From observations to experiments: Describing and characterizing gravitational instabilities of volcanic plumes”. The contribution of C. Bonadonna was supported by the Swiss National Science Foundation Project No 200021_156255. We thank James White (Executive Editor), Joe Dufek (Associate Editor), David Jessop and one anonymous reviewer for their constructive comments that greatly improved the manuscript.